Sonic Advance (AKA ソニックアドバンス Sonikku Adobansu in Japan) is a 2D side-scrolling platform video game developed by Sega for the Game Boy Advance in 2001. 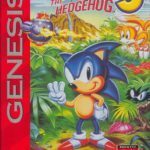 It is the first Sonic game released on a Nintendo console, despite both Sega and Nintendo being well-known rivals on the console market throughout the 1990s. The game was followed by Sonic Advance 2 and Sonic Advance 3. If you are into games with great graphics, you shouldn’t miss Sonic Advance. Critics pointed to the game’s graphics as to why they rated it favorably and compared it with the original Genesis games. But it must not be just because of the graphics. Considering that the game landed a spot in the GBA’s bestselling titles and a commercial success of 1.21 million copies sold, there must be something more that makes this game shine. We’re going into that. First off, we’re talking about a game whose main character, Sonic the Hedgehog, moves with a speed of a torpedo. That blazing speed, along with Sonic’s hip attitude, catapulted the game into one of the amazing success stories in the video game genre. Sonic was on its way to becoming the 2nd most recognizable video game character of all times. So you’re really going to be fast with this one? Yes, and that’s because the game is really meant to display Sonic’s incredible speed. See our hero shows that speed with different fun movements. No, it’s not going to be that boring straight line all throughout. Instead Sonic will be on corkscrews, long straightaways and also ramps. Some still find the movements at maximum velocity a bad feature of this game. Well, with the fast movements gracing the small GBA screen, it is required that you have a speedy vision that can make you catch all the details in the game. For us, that’s not a problem. It’s not important to keep track of all the details, and besides, there’s the backlight of the console (GameCube GBA Player and SP) to help with the issue. As Sonic, you have an enemy to defeat, and his name is Doctor Eggman. He’s out to capture the animal population in a certain island, with the intent of turning them into evil robots. There are four characters in the side of the good – Amy Rose, Knuckles the Echidna, Tails and of course, Sonic – and you can choose only one of them. Tails can fly, Knuckles can climb walls, and Amy Rose can kill enemies using a hammer and Sonic has this “insta-shield” technique that he can use to protect himself for a brief moment. You can finish this game in less than two hours, and the short play time is the game’s most serious setback. Fortunately, there are multiplayer options which you can use to play with your friends who themselves must use a GBA to join you. 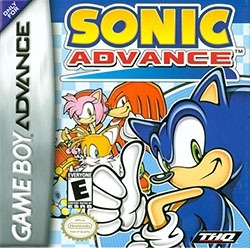 Sonic Advance game has been ported to Game Boy Advance (this version), Nokia N-Gage, and Android devices.